There isn’t much I dislike more than stink. Ick. I am very sensitive to smell, and also a mom, which means I’m pretty much screwed. There have been pee smells, number 2 smells, sick smells, milk spill smells…the list could go on and on. Now my kiddos are older and we have added a dog and cat to our family…so those smells have been replaced with teenage boy smell, outdoor kid playing smells, and dog stink. Well, I try to fight the stink as much as possible. I have bought every candle known to man, plugins (which aren’t very safe), and chemical filled fabric refreshing sprays, and they work just fine. I wanted something a little less chemically (that’s a word – well, it is to me). I did some research, and it seems that baking soda is the one natural ingredient that really has the power to neutralize odors. That’s fab, but I like pretty smells too. 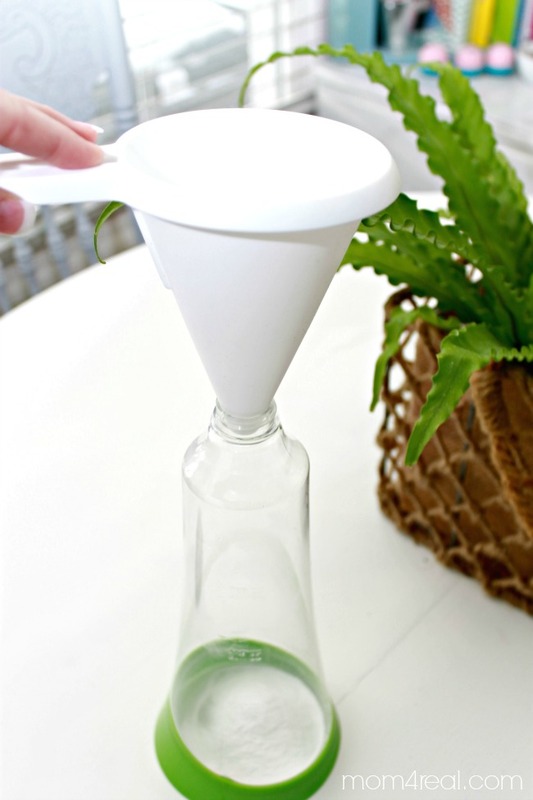 I put together the best smelling solution on the planet, and today I’m going to tell you how to make your own fabric refresher spray … a natural cleaning trick! 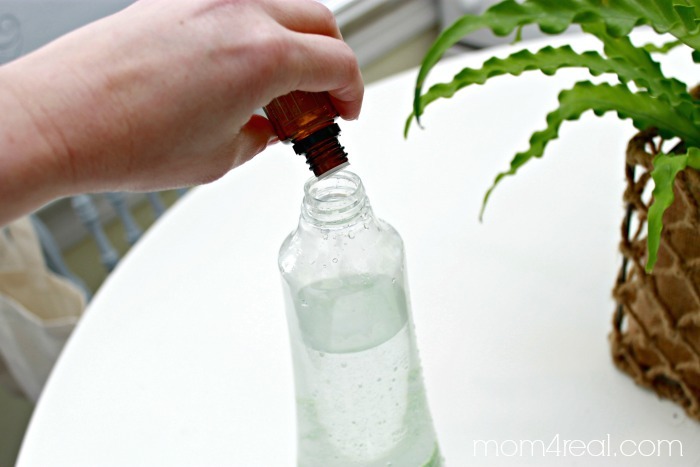 I start by adding 1 tablespoon of baking soda to a clean spray bottle. You can buy these for $1 at The Dollar Tree or clean out an old spray bottle thoroughly and recycle it. Next I add two cups of warm water, put the lid on and shake until the baking soda has dissolved. Now I take the lid off and add 10 drops of lavender essential oil. I love the smell of lavender, but you may not….no problem…just use a different scent, like maybe lemon? Put the lid back on and shake well. Now, spray your fabric or just spray it all around the air! I use it on curtains, bedding, pillows, furniture and my rugs. It smells like Heaven, and I don’t have to worry about spraying chemicals all over the house where my family lives…that’s what you call a win – win! Looking for more cleaning tips and tricks? You can check out my post on How To Clean In Between The Glass On Your Oven Doors, HERE … or you can click the picture below to be taken to all of my cleaning tips and tricks! « Stenciled Burlap Monogram & a Pinterest Party with Michaels and Hometalk! Baking soda is a beautiful thing! I recently bought a rose petal essential oil. It might be fun to give that a try with this! Going to try this. I have been making my own cleaners for awhile now but I have been looking into a good smelling spray. I can’t wait to try it. 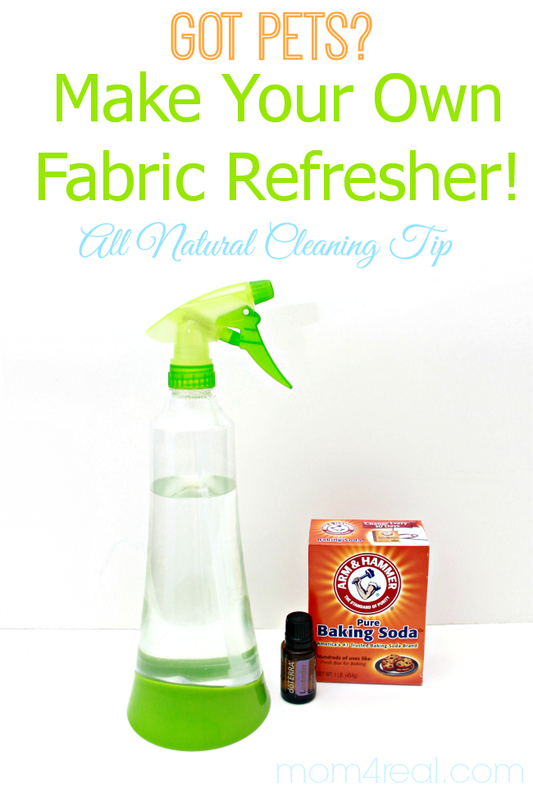 Does this spray leave any sort of residue from the baking soda on your fabrics once it dries? I have found that it does. I mixed it along with a fabric softer when I cleaned male apartments. Hi! Quick question. What is the shelf life of this recipe? Do I have to use a preservative since water is part of the recipe? I found that recipes that contains water can only be stored for 2 to 3 weeks at most if a preservative is not used. If I am considering making this in larger batches to give to family and friends? Thank you. One thing I do to help the spray last longer is use distilled water instead of tap water. LOVE LOVE LOVE THIS! THANKS! Question won’t the essential oils stain my fabric? Is this spray-concoction a one time use (once you’ve mixed it)?…or can you store the extra/remainder, to use @ a later date?!? Baking soda is definitely the ingredient that makes the difference, i’ve found. All the recipes I’ve tried that don’t have it don’t work as well. But it’s gunking up my spray bottles! The baking soda doesn’t leave any residue on the sprayed items (so far, anyway, and I’ve used the recipe quite a bit) but I think it’s leave a powdery residue that is clogging up the spray bottle because every single bottle I’ve used a DIY recipe in starts gumming up the workings of the spray bottle so that I have to uncap and put on a bottle with hot water and have to spray and spray with until the nozzle, etc., cleans up and that I have to do after each use to keep the pump bottle working! It’s aggravating. Does anyone know of a solution, by any chance? I hate to say this but adding more oil to the solution has been my fix for bad spray bottles. I’m not sure what happens but my spray bottles stop spray with the essential oil cleaners I make. I started adding a little bit of coconut oil to my cleaners and it solved my problem. Honestly I would do away with the baking soda in this recipe and use witch hazel or rubbing alcohol, that way you can use the spray for more things. I made a similar spray using vodka instead of rubbing alcohol and I am not liking the underlying smell of the vodka. Maybe I should try the rubbing alcohol one. I wanted a disinfectant AND scent spray, for my couches etc. Have you tried using Witch Hazel? I find the baking soda is what is gunking up my spray bottle. No matter how long i shake it. Amazon sells bottles with spray atomizers for olive oil, so you might try one of those. I’d tried regular spray bottles for my oil, and they always clogged, so I bought one of these special bottles for oils. Haven’t tried it, as I just got it, but the atomizer (sprayer) is different, so I’m betting it works. Once you are finished spraying, twist off the spray nozzle and simply place the end inside a cup of water to pump it through the entire nozzle. This will clean out any solution that has the baking soda and replace it will plain water. Prevents clogs. Thank you for this recipe! I used grapefruit essential oil. It made my apartment smell so fresh! Hi! I absolutely love this idea for refreshing seasonal clothes that you bring out of storage. Could I use lemon juice, or does it have to be essential oil? Thanks. Hi, Megan! You can use lemon juice, but you will need to store it in the refrigerator, and only keep for up to 3 weeks. Hope this helps! 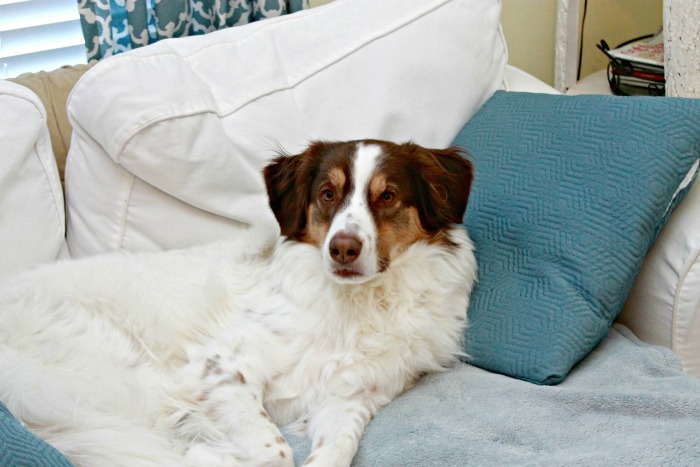 Are there any essential oils that are harmful to dogs? Is this recipe ok to spray on dog beds? Yes. Tea Tree oil is toxic to cats and dogs. Use other essential oils instead. There are other oils that are toxic to cats so read up on it before you use any essential oil. I am a lover of doterra but do not have animals Birch Oregano Clove Wintergreen Thyme Peppermint Citrus-based oils Eucalyptus Melaleuca (Tea Tree) are some oils you do not use around cats. I use lemon for a lot of my sprays but you would not use it around cats because its citrus. I have used Downey and water for years on my couch and carpets with no problem.